The latest stop motion animated film from Laika, Missing Link continues their perfect track record, while also being somewhat of a departure for the Portland, Oregon studio. While the studio’s first four films – Coraline, ParaNorman, The Boxtrolls and Kubo and the Two Strings – all focused on child protagonists and were tonally quite dark, Missing Link has adult characters and is more of a comedy. There is also a very British sensibility to Missing Link and its style of humour that reminded me a lot of Aardman. This is not to say that it doesn’t still have its share of dramatic moments, because it has a lot of heart and is also quite touching when it needs to be. But there is a brightness and buoyancy to Missing Link that makes it a delight to watch, and helps to distinguish it from Laika’s previous films. The film centres around the friendship that forms between the 19th century adventurer Sir Lionel Frost (Hugh Jackman), who is desperate to make a discovery that will get him accepted instead of mocked by the elite explorers club that he longs to be a part of, and an eight foot tall Sasquatch that he names Mr. Link (Zach Galifianakis). You see, Mr. Link is quite lonely, being the last of his species and having to stay hidden in the woods of the Pacific Northwest, and he has reached out to Sir Lionel Frost in hopes that he will be able to help him find more of his own kind by journeying to Shangri-La in the Himalayas. 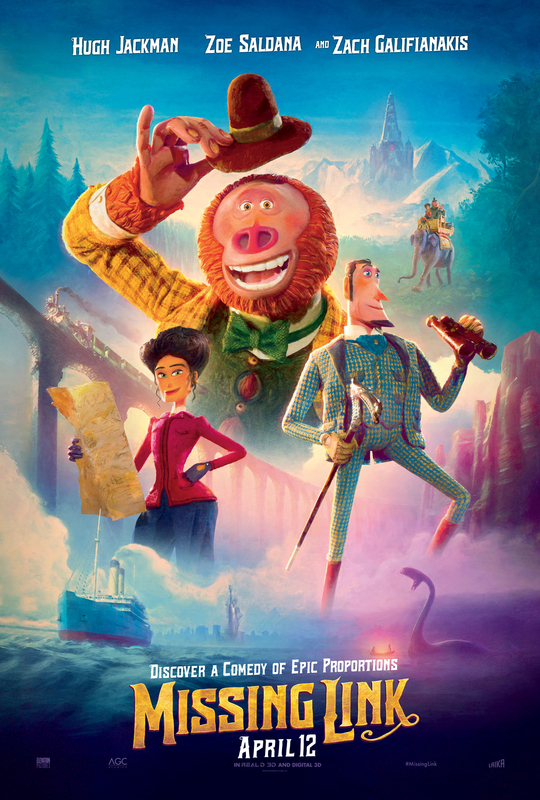 Because Mr. Link represents the “missing link” between ape and man, the bigoted Lord Piggot-Dunceby (Stephen Fry) feels threatened by the implications of Sir Lionel Frost bringing back proof of evolution, and sends the hired gun Willard Stenk (Timothy Olyphant) out to try and stop him. Also joining them on their journey is the headstrong explorer Adelina Fortnight (Zoe Saldana), who happens to be the widow of Frost’s former partner. The film is as visually stunning as we have come to expect from Laika, from the unique character designs to the impressive handcrafted sets that give a very tactile feel to the film. The stop motion animation is seamlessly blended with some digital effects, and the film’s action scenes are groundbreaking for their use of quick cuts, which are rarely seen in stop motion due to the length of time it takes to set up every shot. The voice acting is also spot on. Jackman perfectly embodies the role of Sir Lionel Frost, and his puppet counterpart actually bares somewhat of a resemblance to him, and Galifianakis brings a certain innocence and vulnerability to his role that makes his character instantly loveable. The main character arc belongs to Sir Lionel Frost, who has to learn how to be less self-centred, and become the friend that Mr. Link already thinks he has. Mr. Link, on the other hand, is very genuine and pure and has a tendency to take things literally, often in the most hilarious of ways. Because of this, their friendship is a bit unbalanced at the beginning, with one half viewing their relationship as something deeper, but the bond that forms between them over the course of the film is actually quite touching to watch, and this is a big part of why Missing Link works so well. The film marks the first solo outing for writer-director Chris Butler, who previously co-directed Laika’s ParaNorman, and he once again brings a very personal touch to Missing Link. It works on the surface as a fun adventure movie with elements of a buddy comedy, but there is also quite a bit of subtext lingering underneath. This is really a story about the deep-seated prejudices that have always existed in society, and the struggle of trying to find your own identity in a world where nobody else is like you. If you take into account the fact that Butler is openly gay, the story takes on even more depth. Similar to ParaNorman, a zombie movie that also functioned as a deeply moving allegory for being different, there are fascinating undertones to Missing Link that give the film deeper meaning. One of the film’s most tender moments comes when Mr. Link has the chance to give himself his own name, and he chooses Susan, completely comfortable with the fact that it is traditionally a girl’s name. Despite the fact that he is a gigantic Sasquatch, the name weirdly suits him, and really captures the fact that he is a gentle giant at heart, whose own identity is at odds with how people see him. The film offers good humour, both verbal and visual, and it takes us on an entertaining adventure. But there is also a great deal of heart to the story, and it’s the little moments like this one that make Missing Link feel like something special. It’s delightful, and sure to put a smile on your face, while also gently tugging at your heartstrings. Missing Link is now playing in theatres across Canada.